A concise history of Saddam’s road to ruin – the denouement of Iraq. 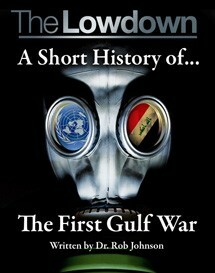 This title gives an explanation of the causes of the Gulf War in 1990-91 and how the Iran-Iraq War of the 1980s shaped the political and diplomatic landscape that led to a confrontation between President Saddam Hussein of Iraq and a world coalition led by the United States. DR ROB JOHNSON is Deputy Director of the Oxford Changing Character of War Programme and Lecturer in the History of War at the University of Oxford. His primary research interests are Afghanistan, Pakistan, Iran and Iraq, and his work includes conventional military operations, irregular warfare and counter–insurgency, as well as intelligence and strategy. He lectures on the History of War in the Nineteenth and Twentieth Century, and is a specialist on Afghanistan. Rob Johnson’s recent publications include: The Iran–Iraq War (Palgrave, 2010); How to Win on the Battlefield (Thames and Hudson, 2010), and Oil, Islam and Conflict (Reaktion, 2008).